Post-processing articles, tutorials and tips for underwater photography and video, including Lightroom, Photoshop and GoPro Studio. 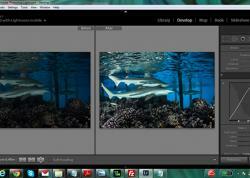 Custom White Balance is an important tool for every underwater photographer when using Lightroom. It does not take very long, but can make a huge difference in your final product. I have put together a demonstration video showing how to use this tool, and three situations where you may find it particularly useful. To start, here is a video with a brief intro on white balance. If you already know white balance inside out, then skip down the tutorial video below! And don't worry, if you are someone who likes to learn by reading (ie "old school"), I have covered the same material in the Alternate Text If You Don't Watch the Video section. The human brain is an amazing thing. One of the many pieces of processing it does is that it compensates for different lighting conditions. Think about a simple white box. Whether you are looking at it outdoors in the bright sunlight, under a tree in the shade, below overcast skies, or inside of your house under an incandescent bulb, you will see basically the same thing; a white box. This is thanks to your brain, because in reality, under these different lighting conditions, the box actually looks different. As your camera is a very poor replica of your eye and brain, it cannot just magically render the box white under different lighting conditions. White Balance is your camera's attempt to define "white" through a library of different color compensations, depending on the quality of lighting in your scene. Your camera tries its best to detect the color of light it is "seeing", and then applies a color correction algorithm that corresponds to this lighting. The White Balance setting is defined by the Temperature, measured in degrees Kelvin. Below is a graphic explaining the white balance scale. But imagine how much your poor camera can get confused underwater, when there is blue/green, ambient light filtering through water, combined with the sharp artificial light of your strobes. And this all varies based on how far away you are from your subject and the surface! As a general rule of thumb - if you are shooting underwater with strobes, use Auto white balance. Although as explained above it can be quite a technical challenge for your camera to get the right white balance, a lot of the time it will do anywhere from a decent job to getting it bang on. And if not, as long as you shoot RAW you can correct in Lightroom with no loss to image quality. If you are shooting without strobes, shoot manual white balance and bring a white slate to meter your white balance. Built-in underwater white balance settings created by camera manufacturers generally don't work well. I have an example photo for each of these situations, and I walk you through how to use this function to improve each one. But before we start, let's quickly go over how White Balance works in Lightroom. There are two settings for white balance. The first is the Temperature, in degrees Kelvin, while the second is the Tint, in unspecified units (as an engineer, this bothers me more than it should). Here is a sample photo where the background is, in my opinion, too green. It would look better being more blue, and that would also reflect better the actual conditions encountered while taking this shot. My as-shot white balance for this photo was 5350 temp, and +15 tint. To do a custom white balance, select the white balance eye-dropper in the develop tab, and then select a target neutral on your photo. The target neutral is a part of the photo which you want to be either white or grey. Often, I find it is easier to find something grey than white. I also find that I sometimes have to try a few different target neutrals before I get one I like. My first spot I tried, in the fluffy substrate below the sea dragon, custom white balance gave me a temperature of 8300 and tint of +150. When the custom white balance selects either a very high or very low temperature or tint, this is often a sign that something is a bit off. As you can see, this is way too much tint and the photo is much too red/purple. So I tried a different piece of substrate, more towards the bottom left of the photo, and Lightroom corrected to a temp of 6100 and tint of +83. This is a lot better, but there's still maybe a bit too much of a red/purple tinge in the bottom right of the photo. So if I want to make things a bit less purple-y and more green-y, I just have to adjust the tint downwards. I manually knock 12 off the tint, giving me a final shot with a Temp of 6100 and Tint of +71. Some strobes emit a warmer light, while others emit a colder light. Adding a diffuser to your strobes makes your light a bit warmer. I shoot with Sea & Sea YS-D1s, with diffusers, and this setup gives me nice and warm light. I often tend to notice this warmth when shooting macro, and it is most pronounced for shots taken at night. Your strobes may be warmer or colder than my setup, but the idea is the same. 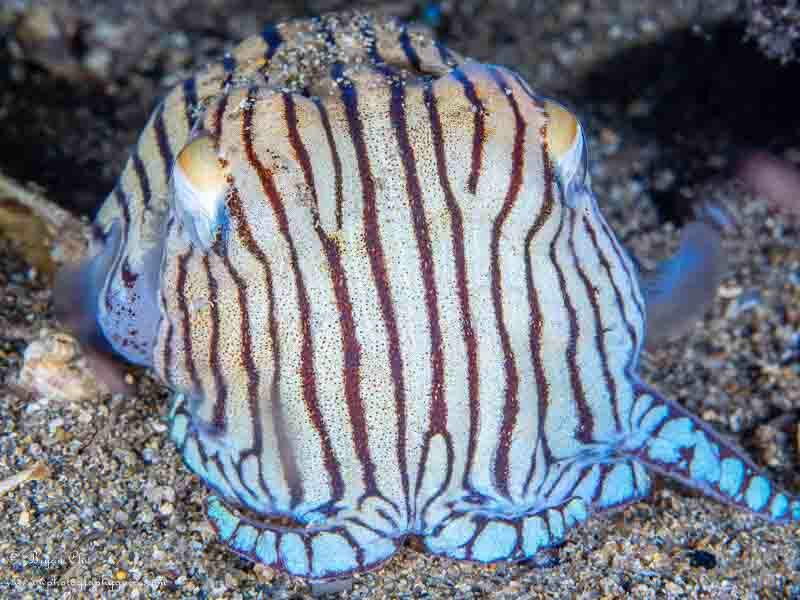 Here's a shot I took of a pyjama squid on a night dive. The as-shot white balance combined with my warm strobes resulted in quite a yellow-y cast to the photo, with a Temperature of 5050 and a Tint of 13. This needed to be fixed, as I don't want my pyjama squid looking like it has jaundice! Doing a custom white balance, I could either use the white of the squid's tentacle or eye, or the grey of the sand. The squid still gave me too warm of a cast to the shot, so I tried it on a few different pieces of sand. I found a piece of sand which I liked, which adjusted my Temperature down to 3800 and my Tint up to 22. It looks a lot better. The squid is still a bit yellow-y, but that is because it was turning yellow-brown in response to me approaching it. However, I feel that perhaps I made the shot a bit too cold, so I tweak the temperature up a bit to 4000. It is nice to have a bit of warmth. This looks like a good representation of the actual colors of this little guy, as well as the background. Just remember: if your photo looks "off" for some reason, there's a decent chance it's a white balance issue. It never hurts to play around a bit. I tend to notice this problem when shooting wide angle, with large subjects that are more than a few feet away and against a blue background. It is often due to having a good amount of water between the camera and the subject, and not lighting the subject with enough artificial light. 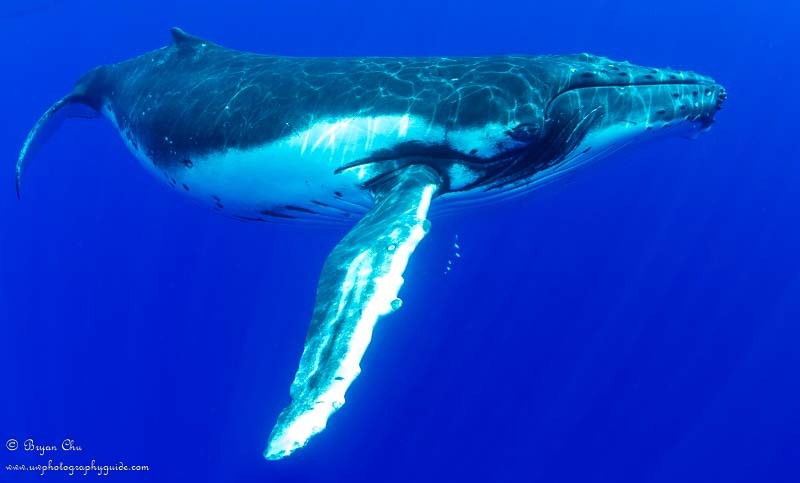 This photo of a humpback was taken in ambient light, a few feet from the lens. The as-shot white balance of 5650 Temp and 7 Tint gave a blue cast to the whale, so it didn't pop as much as I wanted. So I did an auto white balance on the whale's white belly, to see what lightroom could do about it. Lightroom basically went crazy, giving me the maximum temperature of 50000 and a tint of 122, as it was trying to compensate for all of the red light lost in the blue water. So, as usual, the custom white balance went too far. I mean this photo does pop, but in a way that makes it look a bit fake. When I scaled back to a temperature of 15000, and tint of 75, I got a product I was very pleased with. White balance is very important but often overlooked. Don't forget to try it! Custom white balance can sometimes over-correct, so check to see what happens if you go somewhere in between the as-shot white balance and the custom white balance. It's one thing to watch a video or read an article, but it's always better to apply anything you learned (if you learned anything!). So take a few minutes to look back through some of your old photos. See if you can find three where you want to adjust your background color, the whole photo might be too warm or too cold (ie the colors look a bit "off"), or your subject is a bit blue and you want it to pop better. Play around with custom white balance and see if you can improve any of those photos. Then, as you move forward with processing your next images, remember to think about Custom White Balance during your editing workflow! I hope you found this useful. Let me know if you have any questions. And if you have a photo and want some white balance advice, feel free to shoot me an email at bryan@uwphotographyguide.com. Happy shooting! Bryan is an editor for the Underwater Photography Guide. He loves any activity that takes him out into nature, and is especially fond of multi-day hiking trips, road trips to National Parks, and diving. Any kind of diving. He discovered the joy of underwater photography on a Bluewater trip to the Sea of Cortez, and after "trial and erroring" his way to some level of proficiency, has been hooked ever since. He has not done nearly as much diving as he would like, but has so far taken underwater photos in a diverse range of places, including BC, the Sea of Cortez, Greenland/Iceland, Northern Norway, the Galapagos and French Polynesia. After working as a chemical engineer at a major oil & gas corporation for 9 years, Bryan finally had enough (and it didn't help that he was living in landlocked Edmonton, Canada with frigid winter temperatures and no real diving to speak of). He and his girlfriend decided to pack up their things and travel the world; they started their journey mid-2018 and will visit a number of great dive locations along the way. He is very excited to expand his underwater photography experience and skills while experiencing new cultures and exciting parts of the world. Though he is also a bit worried about the following equation that has so far defined his dive travels: Corporate job ($$) = Dive travel ($) + Underwater Photography ($). Taking away the left side of that equation seems like it might put things a bit out of balance. But as he reasons, what's the point in life if you can't take some big risks and have some fun along the way? Bluewater Rigs trip May 2018 from Todd Kortte on Vimeo. Modern innovation has made it easy to capture a photo or video of an underwater adventure and share it on social media platforms for the world to see. One of the easiest ways for divers to capture underwater video is with a GoPro camera. 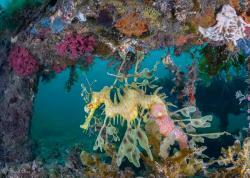 Recently, I set out to do more underwater video tests on the GoPro Hero6 – and what better place to find gorgeous colors and life than on the structure of the Eureka Oil Platform off the coast of Southern California. The Eureka sits in 700 feet of water 8.5 miles off the shores of Long Beach. An abundance of sea anemones, scallops, mussels, and brittle stars encompass the structure and sea lions, mola molas, large bait balls, and schools of circling predators frequent the surrounding blue water. This makes the oil rigs a popular place for underwater photography and video. In this article I am discussing tips for shooting underwater video with the GoPro Hero6 and using a macro lens. The recent release of the Hero6 offered many amazing features for underwater video, but makes taking videos with a macro lens a struggle. By providing these tips, I hope to offer an acceptable solution to these issues. I recommend watching the "Bluewater Rigs Trip May 2018" video above and then reading through this article. I will be talking about certain sections in the video and explaining the settings and strategy behind shooting underwater video with the GoPro Hero6 Black. This video was shot with a GoPro Hero6 Black as well as an i-Torch Venom50 and an i-Torch Venom 38S for video lights. Topside shots were taken using a REMOVO 3-Axis gimbal resulting in a smooth steady video. Editing was done in Adobe Premiere Pro CC 2018. 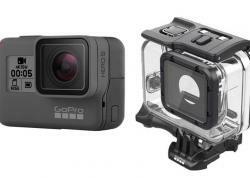 Shop GoPro on Bluewater Photo for all the housing, accessory and shooting tips you need to bring home excellent underwater video. Macro lenses for the GoPro have been relatively convenient and reliable. They require your GoPro to be set in the "narrow" field of view. This is something the Hero6 cannot do. When not in a “narrow” field of view, the lens will blur the edges. Setting older versions of the GoPro to the narrow mode allowed the macro lens to crop out the blur from a wider field of view, resulting in a full frame of clarity. Unfortunately, the only way to achieve the "narrow" setting on the GoPro Hero6 is by a touch slider on the LCD screen! This of course is something you cannot do underwater when the camera is in a protective housing. Hopefully a fix will be offered by GoPro in the next firmware update. For now, macro videos can only be shot in a wide field of view resulting in a stretched out, blurred edge on your video. The best current solution is to shoot at a higher resolution with the wide lens setting, and then crop out the blurry outer edges of the frame in your post editing process. While this is a less than desirable setup for macro video, it still produces good results. To Stabilize or Not To Stabilize? Others have suggested shooting 4K with GoPro macro lenses. Shooting 4K would give you more resolution in your cropped image; However, I would highly suggest not shooting 4K with the macro lens. The GoPro Hero6 can shoot 4K at 60fps, but without video stabilization. 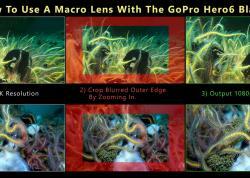 Shooting macro underwater without video stabilization will result in an undesirable and very shaky video. The GoPro does have 4K stabilization at 30fps, but the long shutter speed results in motion blurriness in your video. 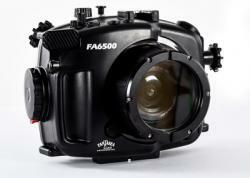 I do not suggest shooting underwater video with anything less than 60fps. Go to the 25 second mark in the video above and look at the salp. This is a 4K 30fps macro test. You can see the salp macro is in focus but there is still a blur in the movement. That's because it was shot at 30fps and the longer shutter speed creates a motion blur in the video. Motion blur creates a nice cinematic look, but for underwater video we want clean clear movement. That's why I suggest shooting no less than 60fps. Now look at the strawberry anemones and scallop (1 min 30 seconds - 2 minutes) in the video above. This was shot in 2.7K (2704X1520) at 60fps (with image stabilization) and I cropped out the blurred outer edges of the video. The output after cropping is HD 1920x1080 – a very acceptable definition. Now look at the amazing field of brittle stars at 2min 50sec - 3min 20sec. Brittle stars make great subjects for video and photos. They have an amazing range of colors, and their movement, if you can capture it, is really fascinating to watch. You'll notice the movement in the cropped video is not blurry. With 60fps, the increased number of frames results in a sharper, cleaner video. I also reduced the playback speed to 70%. Another benefit of shooting video at 60fps or faster is the flexibility to slow down your playback. The structure of the oil rigs can have strong current and surge. Keeping a steady shot in moving water during a bottomless dive can be very challenging. If you can capture 2 or 3 seconds of stable video at 60fps and then slow it down in post, you can stretch the clip to 4 seconds. Go back to the 1 min 30 seconds mark in the video, and count the seconds. Those 2-3 second macro shots are stretched out to about 4 seconds long. When editing your video, you don't want to hold on to a scene too long unless its telling a story. Start out with a wide shot and edit into a closer shot of the same subject or scene. It will help tell your story, produce smoother results, and make things easier for the viewer. I have used the GoPro Hero3 Silver+, Hero4 Black, Hero5 Black, and the Hero6 Black for underwater video. The GoPro Hero6 continues to pass my expectations, and I still consider it the best release of the GoPro for underwater use. Due improved color accuracy, improved white balance, global tone mapping, and the resulting lack of dependency on filters.... using any version of the GoPro less than the Hero6 to capture your underwater adventure is selling yourself short. If you have any questions or comments feel free to contact me on Facebook at "Todd Kortte Scuba Page." One of the challenges of keeping your images organized and easy to locate stems from having a well-defined strategy for adding ‘keywords’ and ‘metadata’ to your images. 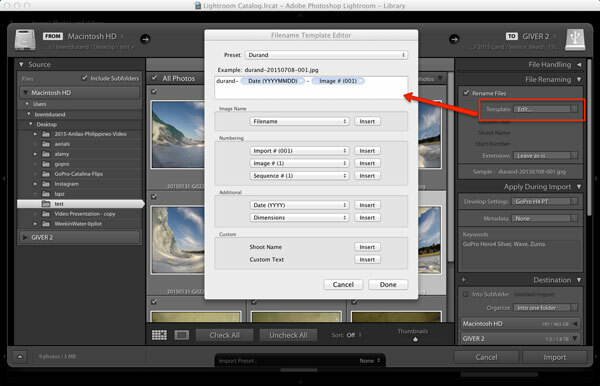 I wanted to share with you one of Lightroom’s most useful tools for quickly adding this information to your images. Getting into the habit of labeling your shots is a worthwhile investment of time and this useful tool should make the work fast and simple. As an underwater photographer, you likely shoot a lot of images, and with that comes the challenge of how to keep track of them all. One of the most important things you can do once you upload your images off the memory cards is to take the time to catalog those images, after making a backup or two of course. There are perhaps as many ways to file and store your images as there are fish in the sea, but that’s a different topic for a different day, but there is one thing that we should be doing as part of our cataloging process, it is keywording those images. In Adobe Lightroom, when you take the time to add keywords, you can quickly go back and find your images at a later date. Adding keywords while the files are being imported to Lightroom makes the most sense. When I import images from a dive, I will create a general set of keywords that apply to all of the images. 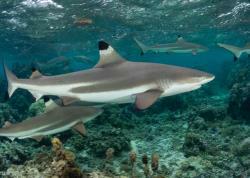 For example, a trip to La Paz, Mexico may include keywords such as Mexico and October, Dive etc. So far, so good...I covered a fe wof the general keywords and applied them to perhaps 1000 images. But what about the individual images within those 1000 files that might require a unique set of words such as Whale Shark, Baja, Snorkel, Split, Scuba, Sea of Cortez, Dolphin, Shark, Food and Sunset , to list a few examples. Adding these keywords may require a lot of additional time, as I need to apply certain words to certain images, but not all images, spread out amongst the 1000 images I uploaded. Lightroom has a great tool, which allows you to save time and apply those keywords in a simple way….it’s called the Spray Can . Find the Spray Can in grid view while in the Library Module. How do you use it? It couldn’t be any easier. Simply select the spray can to access a dialog box that allows you to select or enter the keywords you wish to apply, and then start running your mouse over the images with the left mouse button held down. Do you want to apply a star rating to a selection of images, how about a color code or new metadata? You can do those too with the spray can. You do not even need to click on each individual image...simply run the spray can over an image with the mouse button held down and the keyword is applied...you can even apply multiple keywords at the same time. Could it get any easier? This feature, in my opinion, is one of the best time saving tools in all of Lightroom for what can easily be called the most time consuming and at the same time, one of the most important tasks. Making the addition of keywords to your images should be a part of your workflow, and this is just one of many ways to help make that process both fast and easy. 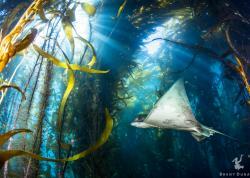 Erik Lukas is an active diver and photographer based in Los Angeles, CA. He is a volunteer scuba diver at the Aquarium of the Pacific in Long Beach, CA. You can expect to find Erik diving many of the amazing Pacific Ocean sites of Southern California, camera in hand, at any chance he can get. 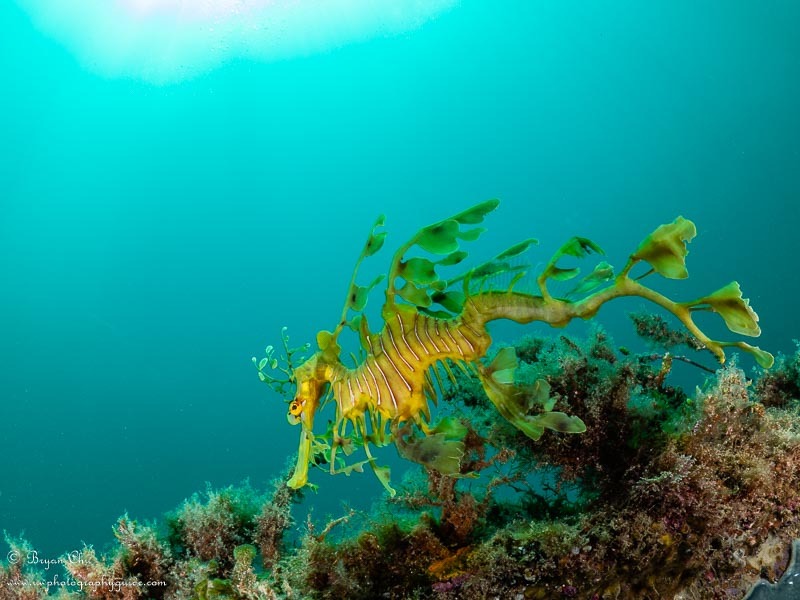 See more of his underwater photography on Instagram at SeeUnderSea, or visit his website at www.seeundersea.com. In this article I wanted to share a method I use to adjust the tonal range of my images. As with most things in life, there is usually more than one way to get the result you are after. In Adobe Lightroom that holds true for many of the tasks that photographers use during the image editing process. What is tonal range? In photography, the tonal range is the spread of values from the lightest to darkest areas of an image, from pure white to solid black, if you will. In Lightroom CC, we have a lot of control over the tonal range of a RAW file, and there is an entire section of the Develop module dedicated to just this...the Basic section, located directly below the Histogram. In this area Adobe has labelled these tonal range controls, or sliders, as Highlights, Shadows, Whites, Blacks, as shown below. Exposure and Contrast live within this control module as well, but more on those later. Notice now, if you place your cursor over the Histogram and move it from left to right, you will see there are five distinct sections which will become a lighter shade of gray. These correspond to these four “tonal ranges”, plus one general control in the center for Exposure. From left to right, they are Black, Shadows, Exposure, Highlights, Whites, and Lightroom gives us two ways to control and modify these. Two examples of the histogram with the Black (top), and the Highlights (bottom) sections selected. The first way, which I suspect most Lightroom users use, is to grab a slider and adjust to the left or right. Makes perfect sense and it works perfectly. Another method that I prefer and I feel gives me a bit more of a visual and perhaps tactile feel to control these is via the Histogram. Simply, click your mouse and hold it over one of the four sections of the histogram and slide it left or right. Move through each tonal range until you have your desired results. You can also hold it over the center section of the histogram to control the overall exposure this way as well. Here I have shown the control over the Exposure. In the first image (top) the Exposure is shown as it was out of the camera, in the second images (bottom) I pushed the exposure to the right to demonstrate the ability to control the exposure by moving the histogram from L to R.
Both methods produce exactly the same results, but for me, I feel that I can focus more on the image and less on the specific slider, and I find I can get the results I want more quickly. This is the first set of controls I touch once I begin to work on an image. The goal is to expand the tonal range of an image to get the most dynamic range possible out of the RAW file. I try to pull the whites as far to the right of the histogram as I can without blowing out any important highlights, and I try to pull the blacks as far to the left of histogram as possible without blocking out any details and textures. The shadows and highlights adjustments can be pretty subjective, but the goal with them is to get important details and textures to show their best. Only after I have gotten the tonal range where I like it, do I move on to other settings and tools within Lightroom...but more on those in a future article. Give this method a try a let me know what you think. In my next article I will go on a show you a trick or two that will further help to speed things up even further once we have the exposure and tonal range where we want it for other, similar images. Lightroom Trick: Learn about using the Crop Overlay Tool. 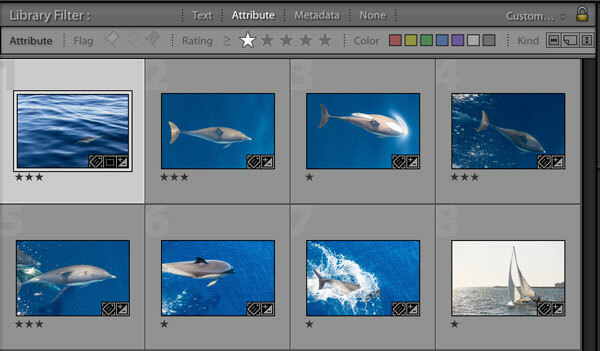 View all of our Adobe Lightroom Post-Processing Tutorials for Underwater Photography. 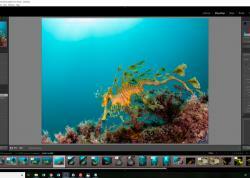 Vivid-Pix, creator of 1-click underwater photo editing software, has just released new post-processing software that can be used with topside photos as well as underwater photos - Land & Sea. 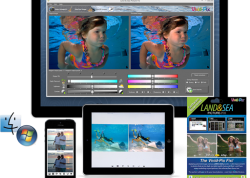 The Land & Sea software is easy to use and makes photo enhancements with just one click. It can be downloaded and used on your phone, tablet and computers. 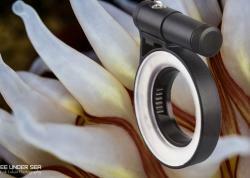 Land & Sea has many different applications for traveling divers. For underwater shooters, it will bring the proper colors and contrast back into your images, editing all your photos in a single click! 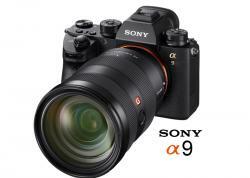 No need to worry about long and tedious single photo workflows. This same one click adjustment now works for all your topside photos too, correcting exposures, color contrasts and more. Additionally, the new mobile app for phone and tablet lets you edit photos on the go. If your photo doesn't look quite right, you can open it in Land & Sea, use the auto adjustment and then post it on Facebook or other social media right away - no need for advanced editing on your computer. Some of the key features of Land & Sea include color adjustment, image rotation, lightness, contrast and a lot more. See the full press release below. Learn more about Vivid-Pix LAND & SEA. Alpharetta, GA (August 25, 2016) – Vivid-Pix, a software company with a focus on photography, announces that its easy-to-use LAND & SEA software is now available on iTunes. The software provides its unique ability to enhance pool and snorkel photos with a single-click. Its Go Anywhere mobile convenience makes it the perfect companion for vacation and travel pictures, both topside and underwater. LAND & SEA incorporates Vivid-Pix’s patented and proprietary image-enhancement technology. This technology permits users to quickly and easily improve their photos by automatically adjusting color, brightness, contrast, and sharpness with a single-click. Simple, intuitive slider controls fine-tune as desired. LAND & SEA software is available for use on computers, mobile phones and pads/tablets. LAND & SEA appeals to serious and novice photographers, as well as people with a zest for travel regardless of whether their camera of choice is a high-end Digital Single-Lens Reflex (DSLR), a cell phone, a wearable camera for adventure sports, or anything in-between. Even today’s best digital cameras or smartphone cameras can create unwanted photographic issues like an image looking too dark or too light, colors that look wrong, an annoying tilted horizon, or tiny subjects when the subject appears too far away. These common problems can all be corrected quickly and easily with LAND & SEA’s powerful and accessible tools without needing to buy and learn expensive and complex image editing software used by professional photographers. Once users are satisfied with their processed image, LAND & SEA lets them save it as a full-resolution file or as a low-resolution HD file for emailing and sharing on social media or both file sizes, easily eliminating unnecessarily large file transfers. Vivid-Pix (vivid-pix.com/) is a software company launched in 2012 by business partners Randy Fredlund and Rick Voight. The company’s mission is to design, create and deliver Fast, Easy Imaging Software. Randy Fredlund is an accomplished Imaging Scientist with more than 100 digital-imaging patents and extensive experience in research, development and product commercialization. Rick Voight has created billion-dollar businesses through product development, sales and marketing for Eastman Kodak and Hewlett-Packard. The Vivid-Pix team is a far-flung group of excellent people who deliver software that helps customers Share the Experience with Vivid-Pix! Vivid-Pix and the Vivid-Pix logo are registered trademarks of Vivid-Pix. All other trademarks are the property of their respective owners. Vivid‐Pix is a software company launched in 2012 by business partners Randy Fredlund and Rick Voight. The company’s mission is to design, create and deliver Fast, Easy Imaging Software. Randy Fredlund is an accomplished Imaging Scientist with more than 100 digital-imaging patents and extensive experience in research, development and product commercialization. Rick Voight has created billion-dollar businesses through product development, sales and marketing for Eastman Kodak and Hewlett-Packard. The Vivid‐Pix team is a far‐flung group of excellent people who deliver software that helps customers Share the Experience with Vivid‐Pix! In this article and others to follow I plan to share some of the tricks and tips I use in my Lightroom workflow, and hope that some of them will help you in yours. If you have any interesting tips or tools that you use, please leave a comment at the end of the article. I am always looking to expand upon my Lightroom skills, so I love to share and exchange tips and tricks I have picked up with other photographers. Today I wanted to share a Lightroom feature that lives within the “Crop” tool of the Develop Module. The feature is the “Crop Guide Overlay”, which as the name implies, overlays one of seven different patterns on the image. I was surprised to find that most people really didn’t know about this tool, so I thought I would share how I use it here for Underwater Photography Guide readers. I use a Mac, so the keyboard shortcuts and my descriptions apply for Mac users. To enable the tool, simply go into the Develop Module (or press D on the keyboard). From there go into the Crop tool (click on the Crop tool icon or press R on the keyboard). I have my system set up to show the “Rule of Thirds” grid by default, as seen below. The options are: Grid, Thirds, Diagonal (photo below left), Triangle, Golden Ratio, Golden Spiral, and finally Aspect Ratios (photo below right). Pressing the letter O key will toggle through all of them. Bonus Tip: Speaking of the O key, did you know that in several of Lightroom’s editing tools, the O key will toggle additional, helpful overlays? Want to see the areas of an image where you have made certain edits...try it in the Adjustment Brush (K on the keyboard), Gradient Filter (M on the keyboard), and others. This will give you the options to “Auto Show”, “Always Show” or “Never Show” the overlays. I leave mine set to always show. Also in the Tools menu, select Crop Tool Overlay to show even more options, such as selecting only those overlays that you would like to have cycle through. One option I use frequently is the “Cycle Grid Overlay Orientation” (Shift + O) which alters the orientation of the grids. This is most useful on the Diagonals for me, but try them on all of the overlays to see which helps you the most on any given image. When I am in the process of editing my images, I look for ways to help increase the aesthetic appeal of the final image. In some cases this involves cropping the image to improve upon the overall composition. I try to use the Rule of Thirds when I frame an image while I am diving; placing important elements of the image on intersecting lines. Here the eye of the juvenile Garibaldi falls roughly on the intersection of the lower left third. Looking for diagonal lines is another long standing “rule” to composing a photograph, and the diagonal crop overlay is great in helping to find those compositions. Below is an example of where I framed an image with the diagonal in mind. The overlay is simply shown here to reinforce that, but this overlay is very helpful for those images where a slight shift in any direction will help align the important elements. Notice the fish's eye falls on an intersection of the two diagonals (which happen to be very close to where the lines would intersect using the Rule of Thirds overlay), and the body falls directly upon the diagonal that intersects the image. Here is another example where I composed the image to have the important elements: the eye of the Damselfish falls onto an intersecting third, and the body on the diagonal. While the crop overlay tool is not necessarily something that will speed up your workflow, or automagically enhance the final results of your editing, it has become a useful tool for me in helping to visualize compositional rules. For anyone who was unaware of this overlay tool, I hope I showed you something new that you can use in your workflow. If you have suggestions or tips with regard to Lightroom or any other editing suite, please leave a comment at the end of the article, as it’s always great to pick up a new trick. I'm very old-school in my approach to photography, striving to get every photo just right in-camera. Each year as I study the work of hundreds of photographers around the world, I'm seeing that heavy post-processing is playing a more and more critical role in turning RAW files into the final images that are published in magazines, on websites and winning photo contests. 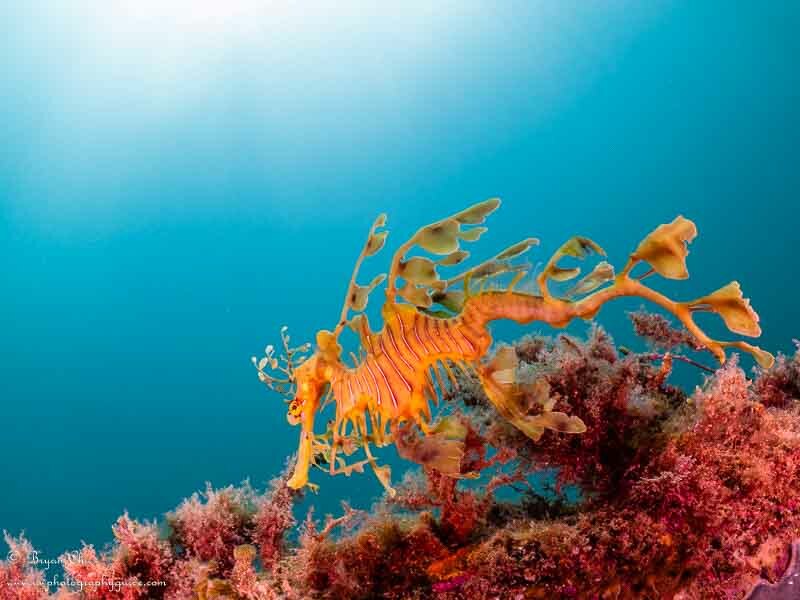 The bar is being set higher, to the delight of all of us who publish images and work hard to share the best photos possible from the underwater world. So with that in mind, I decided to introduce Adobe Photoshop into my Lightroom-only photo workflow. And maybe it's because I log more hours at the desk in a day than diving in the last 9 months, or maybe just have a crazy imagination lusting over opportunities to create new underwater images, but my photos seem to have taken on a surrealness that borders on fantasy... or simply the combination of two different images! Here's a quick tutorial on creating split-shot composite images. The trick to making a good composite image is to find two photos that work together - often two photos that were too boring and un-interesting to share on their own, but given a new life through Photoshop. I spent 21 minutes last Sunday combining the two photos below into one scene. The split-shot is pretty standard but has no interest below the surface. The color/lighting below the surface is pretty even, which makes adding the second image much easier. I have tons of whale shark photos just sitting in Lightroom, so I picked one that complemented the wave in the water of the split-shot, gives the image a chance to live outside of Lightroom. 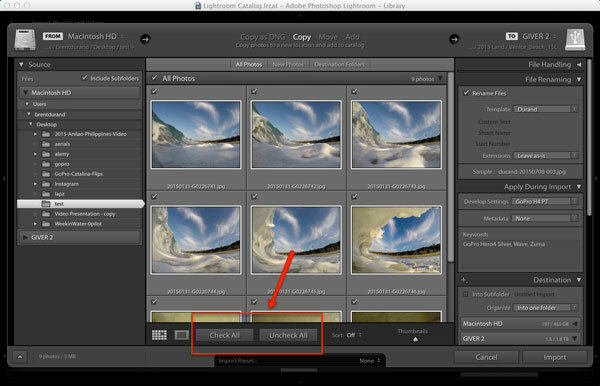 Export both of your images at the same pixel width from Adobe Lightroom. I chose 2500 pixels wide. Next, open both images in Adobe Photoshop. Select the split-shot as your main image, and simply extend the canvas to provide room below it for the whale shark photo. Do this by clicking IMAGE -> CANVAS SIZE and then setting the canvas to 3000 pixels in length. Obviously, this white canvas layer color will not suit our very organic-looking split-shot, so we add a new solid color layer and then sample the dark water color to replace the white. Do this by clicking the Create New Layer icon (half-shaded circle) in the bottom of the layers panel and choosing SOLID COLOR. Next, double-click the white square in the new Color Fill layer and the eyedropper tool will open. Just click the water under the split-shot and the white will be replaced by that color, as you see below. You'll notice that we have some shadows from the reef under the split-shot that are a dead giveaway of the composite. You can remove them easily by making sure you have clicked on the topmost layer (the split-shot photo layer) and then selecting the eraser tool. Simply pass the eraser tool over these areas to erase them, leaving the solid water color from the layer we sampled in step 2. Be sure to experiment with the opacity, flow and hardness of the tool in order to blend the erase marks and create a smooth transition between layers. This is where we insert the whale shark. Like anything with Photoshop, there are many, many ways to remove this whale shark from the background and place it into our split-shot. Because the whale shark doesn't have a clear border around it, I chose to lasso it and then paste it onto the split-shot with a rough blue border. To remove that border, we go back to the trusty eraser tool and slowly erase all of the whale shark background so that you can only see the whale shark's body. I also used a lighter opacity to take away some of the detail around the tail, as it was just too obviously fake if I didn't do that. (It still looks very fake, but hey, this is a fun experiment). Now that our whale shark looks like it (somewhat) belongs, we can make some final changes to finish the composite. First, I thought the whale shark was a bit too bright. I chose the burn tool with a light exposure and slightly darkened the whale shark's head to blend in with the dark sunset water. Second, I moved the entire whale shark to the right, giving it more swim space into the frame (a fundamental composition technique I discuss in photo seminars). Now you just have to click FILE -> SAVE AS and save the file as a .jpg to share on Facebook. Creating underwater composite photos with Photoshop can be a lot of fun. There's really no limit to your creativity, so next time you're on a very long surface interval and dreaming of creating new underwater images, send a couple to Photoshop and start experimenting! Do you have any comments / thoughts on using photoshop to artificially manipulate your images? Feel free to email me at brent@uwphotographyguide.com or send me a message via Facebook - I'd love to hear your feedback. Sign Up for a Photo Class! You can sign up to learn more about post-processing through Bluewater Photo. Based in Los Angeles, California, Bluewater also offers classes through Skype. Brent Durand is a weekend wanderer and story teller from California. Brent is an avid diver and adventure photographer, and shoots underwater any time he can get hands on a camera system. He can be reached at brent@uwphotographyguide.com. Follow Underwater Photography Guide on Facebook or Instagram. Color filters and post-processing are the subject of many conversations with underwater photographers. Which is better? Does it matter if you use a GoPro or even a DSLR? Can you use a filter and then post-process? Is your photo ruined if you make the wrong choice? Whoa, that's a lot, man! In this article we will explore the pros and cons of both underwater color correction methods and the situations when they are best used. Why do we Need White-Balance Correction? Water absorbs light as we descend deeper, starting with the red spectrum. This is why everything looks dull green or blue with little contast when diving at deeper depths, and why savvy divers carry a flashlight (torch) to shine on the reef, bringing out the true, vibrant colors. The same principal applies to photographers, who often use a light source to this same thing (via strobes or video lights). So what about divers who don't bring artificial light underwater? There are two methods for bringing this color back into the underwater scene and giving your photos some "pop." The first is to use colored filters over the camera lens. The second is shooting as-is and then adjusting white balance properties while post-processing. Color filters are most commonly used on GoPro cameras, but can also be used with any compact, mirrorless or DSLR setup. The nice thing with filters is that you can pop one on and then magically get great color and contrast. How does it work? The filter (red, magenta, etc) allows the camera's white balance system to see the reds and chose a much better WB for the photo or video scene. While underwater filters are great for those who want a quick solution, they are not ideal for all divers. Filters work best when the sun is at your back and when shooting in one direction. Filters also perform best in very specific conditions - certain depths or how blue/green the water is. Because of all these variables, filters doesn't always make the camera choose the best white balance. Easy to pop on and off as needed. Some filter sets even come with several filters for different conditions. Because of varying depths, water color and direction to the sun, filters don't alway make the camera to choose the best white balance for the scene. Don't change direction or depth quickly when shooting video with filters, otherwise you will see a dramatic change in white balance as your camera recalculates. Color correction during post-processing can be used anytime your photo looks a bit blue/green or anytime you're shooting ambient light only (below about 6 feet / 2 meters). All photographers from beginner to pro can make use of this area of post-processing. The beauty is that you don't need to worry about buying and when to apply different filters underwater - you just go shoot. Post-processing is viewed as very time intensive, taking as much time as you're willing to put in to each photo, but the results speak for themselves. The ability to customize the precise color temperature, tint and contrast properties allows you to get the precise color you envision for the photo (note that this works best if shooting in RAW format). Easy and Quick: This doesn't have to be time-consuming and difficult. 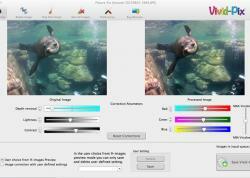 Vivid-Pix makes very easy-to-use underwater photo editing software that literally corrects your photo in one click. You can edit a batch of photos in one click, or dig a bit deeper with customizeable adjustments. Check out our full Vivid-Pix editing tutorial. 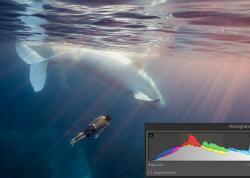 Customize the precise white balance and color of your images. One more step between shooing photos and sharing with with your friends, entering into contests like Ocean Art, etc. If you are using a more advanced camera, try setting the white balance manually. Just remember that your custom setting will change as soon as you move direction to the sun or depth. 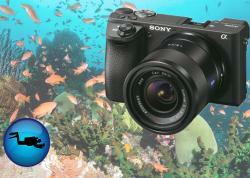 SeaLife cameras have several underwater white balance modes built in. Which is Better - Filters or Post? There's no right and wrong. And just to throw a wrench into the information above, you could use filters AND make some adjustments during post-processing. There are a lot of options out there, so find the method that works best for you. Photo editing can take all the time you’re willing to put into it. Or it can be as simple as one click. One thing is certain however, and that's the fact that post-processing has become a necessary step for underwater photographers who share photos online. In our open water scuba class we learned that we lose color as we descend deeper in the water column, beginning with red. Anyone shooting pictures underwater will also soon learn that we lose contrast as we get deeper and that the photos take on a bland green/blue color temperature. This doesn't create very exciting photos. The good news is that editing helps us bring the photos back to life, increasing that original color and contrast in the image. But with hundreds of photos from a trip, no one wants to spend 10 minutes editing each photo. Enter Vivid-Pix. Vivid-Pix is affordable software that allows you to edit photos in literally one-click per photo, with tools for further editing if you so choose. How does it work? 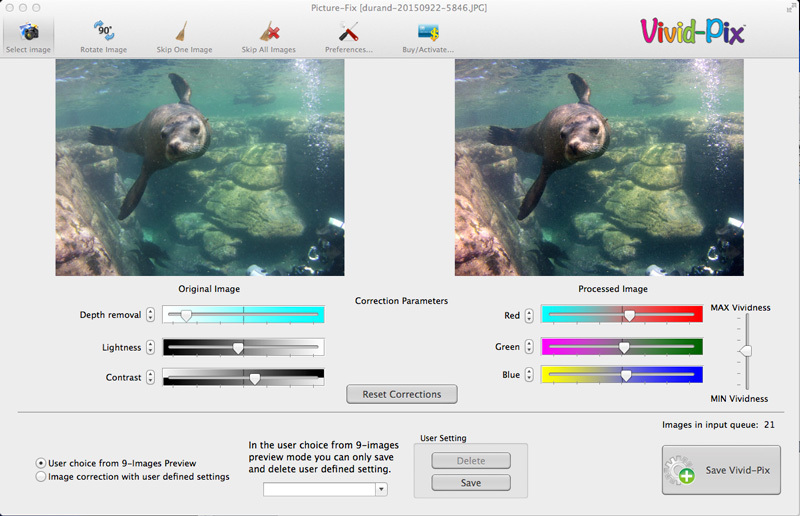 The Vivid-Pix team has developed a custom formula for adjusting the color, contrast, sharpness and brightness of underwater .jpg images. Simply import your photos, select the version of the edited image you like best, adjust a few sliders if you want to further customize the editing, and then click save. The best part is that your edited photo saves as a new .jpg, meaning you still have your original photo saved… just in case you want it for any reason. Import one or multiple photos. Just click “Select Image” in the upper left of the Vivid-Pix screen. Select the edited version of the photo that presents what you feel is the best lightness and contrast. If you imported multiple photos, you will complete steps 3 and 4 for each photo, returning to this stage for each photo after that. Here you are presented with a comparison of your original image to the edited image, where you can either click Save Vivid-Pix to save the image with the default edit or make some custom edits. For those that wish to make further edits, there are 6 sliders to adjust. Each slider will increase or decrease the correction parameter as labled. If you play a bit too much and want to start over, you can hit the Reset Corrections button. Once you’re happy with the new image, click Save Vivid-Pix. And that’s it – you’re done! This is where you will edit the next photo if you imported more than one. Crop Image: Want to crop? Just click and drag a box around the section of the image you would like to keep. Upon release of the mouse button, the crop will be applied. Create a User Defined Setting: If you create an edit you like and have many photos that need the exact same correction, simply save your current edit settings as a User Defined Setting. Then, when importing the remaining photos, just click the button for “Image correction with user defined settings” instead of the “User choice from 9-Images Preview”. Your custom settings will automatically be applied to the new photos. We can see in the sample photos below that the software does a great job editing my .jpg images. The images were recorded with the SeaLife Micro HD+ in a flat color setting – used so that I could have as much editing leeway as possible. 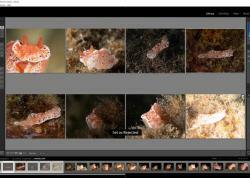 Adobe Lightroom has become the standard for editing and organizing underwater photos, at least for those who consider themselves serious photographers. Adobe has worked hard to earn this position, building more robust tools and features into each new release. Lightroom is designed to streamline photo workflows for working pros shooting thousands of images while remaining simple and intuitive for photographers of all levels. No matter what our level of u/w photography, we can always benefit from more optimized workflows. 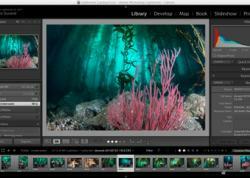 If you're new to Lightroom, be sure to read our intro tutorial 5 Easy Steps to Process your Underwater Photos. This tutorial will build upon the intro tutorial by discussing a few timesaving tips for editing photos and cataloguing them for future use ("findability"). There will always be different points of view on deleting images and how to do it, but I believe in 1) never deleting images on camera, and 2) deleting the undesirables instead of keeping every single photo. Lightroom is designed to help you trash the junk and select your keepers, so take advantage of that. 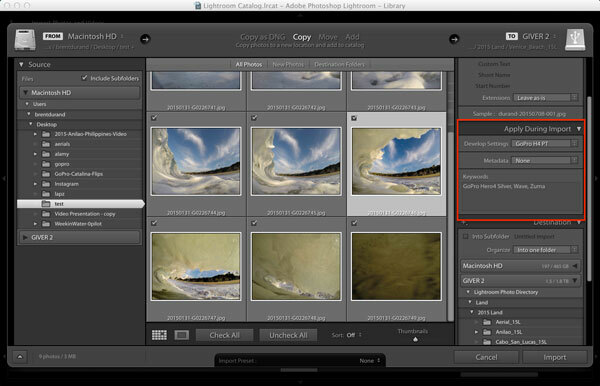 The best way to get rid of the junk is in the Import dialog box, before your photos are imported into Lightroom. You can uncheck the photos that are obviously garbage, or uncheck everything and just check the photos you anticipate keeping. Which method you choose will depend on your shooting style, how unique the shots are and how well you know exactly what you want to keep. While this is my preferred method, my dive trips are not about photos and I often don’t have time to look at any shots until I’m back home. So for dive trips I do my deletion round weeks later (obviously post-import) scrolling through the photos and quickly rejecting the bad ones by pressing the X key. This flags all the photos in that folder as rejects, which can then be deleted in a batch by pressing Command + Delete (MacOS) or Ctrl + Backspace (Windows). One important note is that if you're unsure of whether to delete an image or not - keep it. Depending on whether you keep or delete more images pre-import, you can check all and just uncheck the undesirables, or uncheck all and just check the desirables. The import dialog box allows you to view photos in grid or single image format. The Import dialog box also is where you can quickly apply titles, develop presets, metadata and other actions to many photos at once. By quickly adding all of this broad information at once, all you’ll need to do is work on the individual details of the images later, saving time. This section is where you title your images, being sure that there will never be any title overlap. For example, I use my name to ensure anyone I send the photo to knows it is mine, the date since the date will never repeat and helps me match photos to dive sites and locations in my dive log, and a photo number to differentiate that photo from any others shot on the same date. Titling your images here is helpful, as you should never need to change image title again (LR virtual copies being the exception). If you do change image titles after the fact (using LR), you may run into problems matching your Lightroom previews to the actual RAW files, especially when moving your library to newer hard drives over the years. This is the preset I use for naming files. The next section in the Import dialog box says ‘Apply During Import’. This is where we apply general info to our photos. Develop Settings allows you to select a user preset for developing your image. For example, I have a preset for wide-angle underwater that adds my default formula of clarity, sharpening, saturation, vibrance and contrast to RAW files as a starting point for further editing (which often isn’t needed). If you produce consistent images, this is a huge time saver - literally one-click editing. I don’t use any metadata presents since the terms are almost always different, however I do input Keywords for the group of photos soon to be imported. 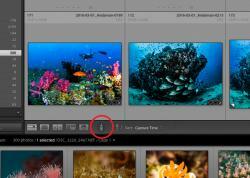 Keywords are metadata that can be used to search for photos within Lightroom at a later date. Let’s say I want to find all the wave photos I’ve shot in Malibu over the last few years. Instead of digging through several folders looking for wave pics, I can search “wave, malibu” and see every image in my catalog containing those keywords. In the Keywords box I will add the general terms like “Malibu, Wave, GoPro HERO4 Silver”, since they apply to all the photos in this import. Later I will add the individual words, marine life names, etc. Applying a develop preset setting and adding keywords in the import dialog box. We are all striving to shoot great images, and if they truly are great, we’re going to want to find them later. 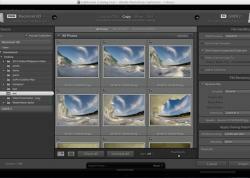 Cataloging your photos to make them easy to find later is one of the main functions of Adobe Lightroom. Ranking your images and adding metadata is not fun and it takes time. But when you have many thousands of images spanning many years, it would be nearly impossible to find a specific photo buried in a catalog folder…. unless you have added all the criteria to conduct a detailed search. Here are the two most useful criteria. These are the key to your searches. You’ve already added the general keywords during the import, so all you need to do is add the specific keywords (marine life, specific behavior, etc). Everyone uses the star rankings differently. For example, 5 stars could be a portfolio image, 4 stars a great image, 3 stars an image you might still show or print, and so on. When you combine keywords with star rankings you can search for not only your “Malibu Wave” images, but the different quality tiers of those shots. Adobe Lightroom is powerful enough to be your sole post-processing tool. This tutorial barely scratched the surface of Lightroom’s functionality and usefulness, however there are only so many words to include in one article. Stay tuned for our next Lightroom tutorial in the coming weeks. 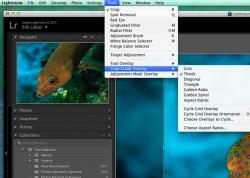 UWPG Publisher Scott Gietler teaches Lightroom tutorials via Bluewater Photo. 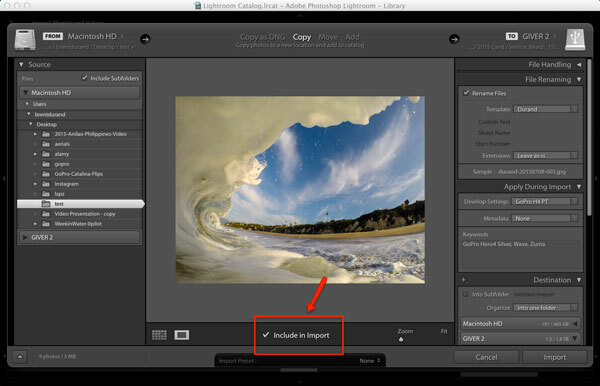 Check out Scott’s article Lightroom for the Rest of Us and book your lesson!